By David BaconWhile the criminalization of undocumented people in Arizona continues to draw headlines, the actual punishment of workers because of their immigration status has become an increasingly bitter fact of life across the country. The number of workplace raids carried out by the Obama administration is staggering. Tens, maybe even hundreds of thousands of workers have been fired for not having papers. According to public records obtained by Syracuse University, the latest available data from the Justice Department show that criminal immigration enforcement by the two largest investigative agencies within the Department of Homeland Security (DHS) has increased to levels comparable to the highest seen during the Bush Administration. Miranda’s question reflects not just the dilemma facing individual workers, but of 12 million undocumented people living in the United States. Since 2005, successive Congressmen, Senators, and administrations have dangled the prospect of gaining legal status in front of those who lack it. In exchange, their various schemes for immigration reform have proposed huge new guest worker programs, and a big increase in exactly the kind of enforcement directed at 475 San Francisco janitors. President Obama condemned Arizona’s law that tries to make being undocumented a state crime, saying it would “undermine basic notions of fairness that we cherish as Americans.” But then he called for legislation with guest worker programs and increased enforcement. First, we want legalization, giving 12 million people residence rights and green cards, so they can live like normal human beings. We do not want immigration used as a cheap labor supply system, with workers paying off recruiters, and once here, frightened that they will be deported if they lose their jobs. We need to get rid of the laws that make immigrants criminals and working a crime. No more detention centers, no more ankle bracelets, no more firings and no-match letters, and no more raids. We need equality and rights. All people in our communities should have the same rights and status. We have to make sure that those who say they advocate for immigrants are not really advocating for low wages. That the decision-makers of Washington, D.C. will not plunge families in Mexico, El Salvador, or Colombia into poverty, or force a new generation of workers to leave home and go through the doors of furniture factories and laundries, office buildings and packing plants, onto construction sites, or into the gardens and nurseries of the rich. Families in Mexico, Guatemala, El Salvador, or the Philippines deserve a decent life, too. They have a right to survive, a right to not migrate. To make that right a reality, they need jobs and productive farms, good schools and healthcare. Our government must stop negotiating trade agreements like NAFTA and CAFTA, and instead prohibit the use of trade and economic policy that causes poverty and displacement. Those people who do choose to come here to work deserve the same things that every other worker has. We all have the same rights, and the same needs—jobs, schools, medical care, a decent place to live, and the right to walk the streets or drive our cars without fear. Major changes in immigration policy are not possible if we do not fight at the same time for these other basic needs: jobs, education, housing, healthcare, justice. But these are things that everyone needs, not just immigrants. And if we fight together, we can stop raids, and at the same time create a more just society for everyone—immigrant and non-immigrant alike. Is this possible? In 1955, at the height of the cold war, braceros and farm workers did not think change would ever come. Growers had all the power and farm workers none. Ten years later we had a new immigration law protecting families and the bracero program was over. A new union for farm workers was on strike in Delano. We can have an immigration system that respects human rights. We can stop deportations. We can win security for working families on both sides of our borders. Yes, it’s possible. Si se puede! While the country is no closer to legalization of the undocumented than it was 10 years ago, the enforcement provisions of the comprehensive immigration reform proposals have already been implemented on the ground. The Bush administration conducted a high-profile series of raids in which it sent heavily armed agents into meatpacking plants and factories, holding workers for deportation, and sending hundreds to federal prison for using bad Social Security numbers. It set up a new Federal court in Tucson, Arizona, called Operation Streamline, where dozens of people are sentenced to prison every day for walking across the border. After Obama was elected President, immigration authorities said they would follow a softer policy, using an electronic system to find undocumented people in workplaces. People working with bad Social Security numbers would be fired. As a result, last September, 2000 seamstresses in the Los Angeles garment factory of American Apparel were fired, followed by a month later by 1200 janitors working for ABM in Minneapolis. 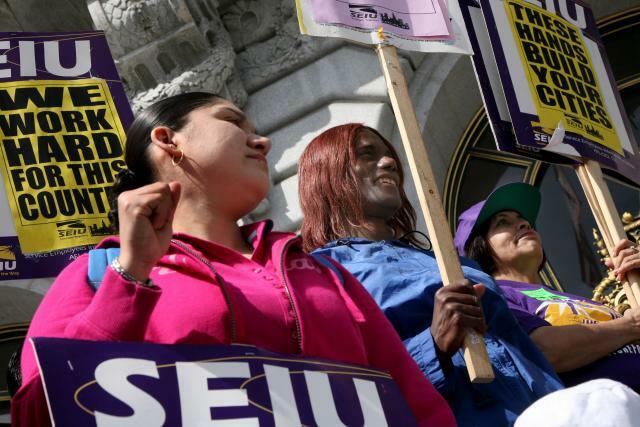 In November, over 100 janitors working for Seattle Building Maintenance lost their jobs. Ironically, the Bush administration proposed a regulation that would have required employers to fire any worker who provided an employer with a Social Security number that did not match the SSA database. That regulation was then stopped in court by unions, the ACLU, and the National Immigration Law Center. The new administration, however, is implementing what amounts to the same requirement, with the same consequence of thousands of fired workers. Meanwhile, the Operation Streamline court is still in session every day in Arizona. “Homeland Security is going after employers that are union,” Miranda charges. “They’re going after employers that give benefits and are paying above the average.” While American Apparel had no union, it paid better than most Los Angeles garment sweatshops. 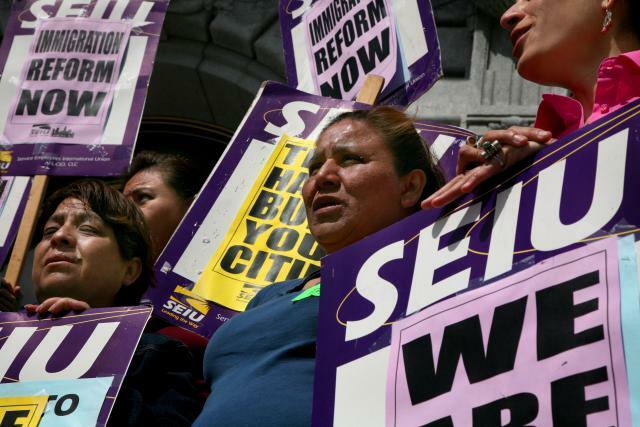 Minneapolis janitors belong to SEIU Local 26, Seattle janitors to Local 6 and San Francisco janitors to Local 87. Increasingly, however, the Washington proposals have even less promise of legalization and more emphasis on punishment. The newest Democratic Party scheme virtually abandons the legalization program promised by the “bipartisan” Schumer/Graham proposal, saying that heavy enforcement at the border and in the workplace must come before any consideration of giving 12 million people legal status. The overwhelming majority of weapons fuelling Mexico's drugs war are being sold in the US, where gun dealers are responsible for supplying at least 60,000 of the illegally trafficked firearms seized by the authorities since 2006.